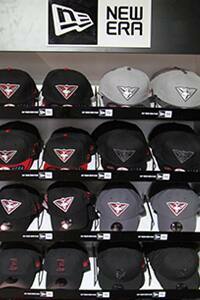 New Era apparel is available in the Bomber Shop at the Club’s Tullamarine headquarters. New Era is the Club’s Official Headwear Partner for the next two seasons. Since 1920, New Era has been hand-crafting the finest headwear on the planet, and is the brand of choice in the worlds of sport, fashion, music and entertainment. In 2017 Essendon’s players, coaches and staff will be wearing a specific range of New Era headwear including the Bombers’ media cap, training cap, beanie, visor and travel cap. General Manager of New Era Australia, Simon Hibbs, said he looked forward to working with the Bombers. "We are very excited to announce our partnership with the Essendon Football Club, as their Official Headwear Partner,” Hibbs said. CEO, Xavier Campbell, welcomed the three leading and progressive apparel brands to the Essendon family.